Dog owners have been urged by the local council to keep their animals under control after a series of fatal attacks on deer living in a Reading graveyard. 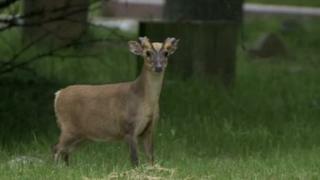 It comes after several roe Muntjac deer were found dismembered in Reading Old Cemetery. Green Party councillor Rob White said: "Owners should keep their dogs on a lead when walking in the cemetery." Warning signs are also being put up in a bid to deter people from walking their pets in the grounds. People living nearby believe dogs are responsible for the attacks. "Something needs to be done about it," said resident Barry Coll. "We're convinced someone's been setting their dog on them." A herd of up to 12 deer - which have a distinctive dog-like bark - were thought to be living in the graveyard. Since then fatal attacks only three stags have been seen. Thames Valley Police said it was investigating the reports of possible dog attacks on deer at the cemetery. Reading Borough Council stressed it had not received any reports of organised activity at this stage. A spokeswoman added: "We will be working with police to investigate further and improve the 'no dogs allowed' signage and security of the site."